Located in the Texas Hill Country, the Fredericksburg Historic District is one of the earliest Germanic settlements in the state. The district encompasses 40 blocks of historic buildings dating from the mid-19th century. Fredericksburg is known for its 19th-century vernacular buildings of stone and fachwerk--a traditional German building technique consisting of heavy timber framing and diagonal bracing, with an infill of limestone. The town was founded by an association of German noblemen organized in 1842. Called the Adelsverein, it was organized in Beibrich, Germany, to encourage and finance immigration to Texas. The Adelsverein brought 7,000 German immigrants to the Republic, and later state, of Texas. In May of 1846 the first immigrants arrived in Fredericksburg. The town prospered, and large-scale German immigration continued up to the Civil War when the largely pro-Union Germans were an unpopular minority in Texas. By the turn-of-the-century, Fredericksburg began to look like many other American towns with residences reflecting popular American architectural styles ranging from the Queen Anne and the Colonial Revival to Bungalows and Four-Squares. 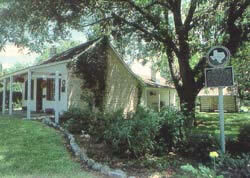 The Fredericksburg Historic District is bounded by Elk, Schubert, Acorn and Creek sts. in Fredericksburg (northwest of San Antonio on I-10). A self-guided walking tour of the historic district is available from the Fredericksburg Chamber of Commerce at 106 N. Adams St. For more information visit the Fredericksburg Historic District Conventions and Visitor's Bureau website or call 830-997-6523. Many of historic places in the district have also been documented by the Historic American Buildings Survey.